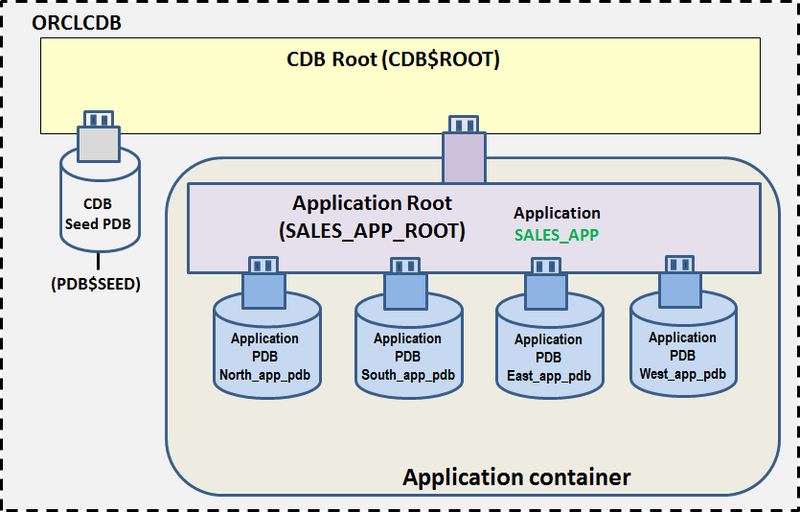 In my last article, Oracle Multi-tenant Application Containers - Part IV, we learned about cross-container aggregation to query user-created data in a metadata-linked table across various application PDBs from one single place; i.e., the application root, without connecting to PDBs individually or creating corresponding database links. In an UPDATE or DELETE statement by specifying a CON_ID predicate in the WHERE clause. In the database property CONTAINERS_DEFAULT_TARGET in the application root: This defines the default target container for DML operations. When it is not set, the default target container for DML operations is the application root. Here, we have an Oracle database 12.2.0.1 CDB called orclcdb as shown. Within this CDB, we have created an application container sales_app for the sales application of an organization. Also we have four application PDBs, north_app_pdb, south_app_pdb, east_app_pdb, and west_app_pdb, which are databases supporting the sales_app application for various regional offices of the organization. While sharing the structure of the metadata-linked customers table stored in the application root sales_app_root, each application PDB can store region specific customer data in the table. Connect to the application root sales_app_root and note that there are four application PDBs (north_app_pdb, east_app_pdb, west_app_pdb, south_app_pdb) ) associated with it. Besides an implicit application, another application sales_app is currently installed in this container. All the application PDBs are synced with application sales_app version 1.0. Let us check the common objects currently in the application sales_app. There is a metadata-linked common application table sales_app_user.customers with the structure as shown. Currently there are not any customer records in the metadata-linked table customers in any application PDB. Now, I will use a cross-container DML to insert application PDB-specific customer records into the metadata -linked table customers while connected to application root sales_app_root. Let us first issue a query to find the CON_ID’s of the various application PDBs. We will need this information to issue the cross-container DML. Let us verify if the above rows have been successfully inserted. It is surprising that despite the message for successful inserts, the records are not visible. The reason is that cross container DML operations need to be completed by a commit so that changes are visible to subsequent queries. Let us commit and verify the addition of the inserted records. We can also verify that the customers added are visible within the corresponding application PDBs as well. While connected to the application root, We can also update rows in a table in an application PDB within the container by specifying the target container by means of a CON_ID predicate in the WHERE clause. Let us update the record for the customer with CUST_ID = 1 in west_app_pdb (con_id = 6).Note that here also a commit is required for the update to be visible. It is worth mentioning here that in cross-container update and delete statements, only one CON_ID can be specified in the WHERE clause; i.e., a cross-container DML can modify table rows in at most one application PDB. Another method of specifying the target container of the a DML operation is by defining the default target container for DML operations by setting the database property CONTAINERS_DEFAULT_TARGET in the application root. Currently, this property is not set. It is worth mentioning here that only one default container is allowed. It can be seen that the above record has been inserted into the current default container for DML operations; i.e., west_app_pdb. Similarly, if an update statement does not specify values for the CON_ID in the WHERE clause, then the target container will be the one specified in the database property CONTAINERS_DEFAULT_TARGET in the application root. Let us issue an update statement using the CONTAINERS clause but without a CON_ID in the WHERE clause. It can be seen that only the record(s) in the current default container for DML operations (i.e., west_app_pdb) which satisfy the condition mentioned in the WHERE clause get updated. Note that customer record has been deleted from the default container, i.e., west_app_pdb. Thus, if a cross-container DML statement does not specify values for the CON_ID in the WHERE clause, then the target container will be the one specified in the database property CONTAINERS_DEFAULT_TARGET in the application root. Now, we will explore what happens when the database property CONTAINERS_DEFAULT_TARGET has been set and the cross-container DML statement also specifies a value for the CON_ID. Now we will issue a cross-container insert statement specifying the CON_ID as 6 corresponding to application PDB west_app_pdb. Note that although east_app_pdb is the current default container for DML operations, a record has been inserted in application PDB west_app_pdb, whose CON_ID was specified in the cross-container insert statement above. Hence, when the database property CONTAINERS_DEFAULT_TARGET has been set and the cross-container DML statement also specifies a value for the CON_ID, the target container is the one specified in the DML statement. To explore this case, we will clear the default container setting by issuing following statement. When it is not set, the default container is the application root. This can be verified by inserting a record into the customers table from the application root without specifying CON_ID in the cross-container DML statement. As the database property CONTAINERS_DEFAULT_TARGET has not been set, the default container is the application root. As a result, the record has been inserted in the application root sales_app_root. Similarly, if we issue an update / delete statement without CON_ID in WHERE clause, the customer record in the application root gets updated / deleted. When the default target container for DML operations is not specified in CONTAINERS_DEFAULT_TARGET and the cross-container DML statement also does not specify a value for the CON_ID, the cross-container DML statement modifies the table in the application root. Cross-container DML statement is a convenient way for the Application Root administrator to perform DML operations on a table in any application PDB within the application container, without connecting to it or creating a corresponding database link. A common user connected to the application root can include a CONTAINERS clause to specify the target table for DML operation in the DML statement. By defining the default target container for DML operations by setting the database property CONTAINERS_DEFAULT_TARGET in the application root. Only one container can be specified as the default target container for DML operations. Cross-container DML operations need to be completed by a commit so that changes are visible to subsequent queries. A cross-container DML can modify table rows in at most one application PDB. The cross-container DML statement also specifies a value for the CON_ID, the target container is the one specified in the DML statement. The cross-container DML statement does not specify a value for the CON_ID, the target container is the one specified in the database property CONTAINERS_DEFAULT_TARGET. The CONTAINERS DEFAULT TARGET clause does not affect SELECT statements.